Of all the bugs we treat for, bed bugs seem to be one of the most misunderstood bugs in the pest world. It may be that these bugs disappeared for a while in the United States, and only started reappearing in the late 1990s. It may be because bed bugs are experts at dwelling with humans. They've had centuries to practice avoiding our attempts to get rid of them. Who knows for sure. So, to shed some much-needed light on these bugs, we've thrown together this quick lists of bed bug facts and fictions. Enjoy! Bed bugs eat blood. Yes. These are blood eaters. This is an important fact to understand. Why? Because bed bugs don't accidentally live with humans. They live with us because their food is inside us. And, since food is a pretty big incentive for any pest to dwell with humans, bed bugs are at the top of the list of infesting pets. Bed bugs can live in a computer. It may seem bizarre, but bed bugs have been found infesting all kinds of electronics. So, if you're thinking you can solve your bed bug issue by throwing your bed out, you may want to think again. You can get bed bugs from the library. It may sound crazy at first, but it isn't so crazy when you think about it. Where do most people read? Yup. In their beds. And, when they're done, they set their books on the night table next to the bed. And, since bed bugs love to lay their eggs in creases and hidden recesses, books are a perfect location. Bed bugs love dirty places. This is actually one of the biggest myths regarding bed bugs, and we cover it in the fiction section below. But, it is important to understand that some people consider a cluttered environment to be "dirty," and bed bugs definitely do well in a cluttered environment. It is much harder to see bed bugs when there is a lot of clutter. And bed bugs like to hide in and lay their eggs in clothing that is left on the floor. Bed bugs attend college. Okay. We're not saying that they're taking classes or getting grades. That would be in the fiction section of this article. But, bed bugs love college dormitories. They prefer to be anywhere that large numbers of people dwell, lounge, and sleep. Bed bugs are only found in run down, dirty motels. This is a long-standing myth about bed bugs. But, as mentioned above, bed bugs are not drawn to dirty places or dirty people. They eat blood, not bacteria. That is why they can be found in the cleanest environments and in 5-star accommodations. Bed bugs spread diseases. Nope. There is no study that has ever been done on bed bugs that connects these insects to the spread of human pathogens. We're not saying it isn't possible. There just is no link yet. Bed bugs lay their eggs in people's ears. Bed bugs lay eggs in a lot of places, but we highly doubt they are going to lay eggs in anyone's ear. They will, however, lay eggs in the seams of a suitcase, a pocketbook, a sleeping bag, a piece of clothing, and more. These eggs are about the size of the tip on a pen, and white in color. Bed bugs only feed at night. Nope. While it is true that bed bugs can sense the increase of carbon dioxide in a room, and this will lure them out to feed on sleeping humans, nighttime is not the only time they can feed. They are equipped with mouthparts and an anticoagulant that allows them to feed on humans when they are fully awake. For this reason, bed bug infestations have been found in movie theaters, taxi cabs, lounge areas, and other places that don't have beds. Bed bugs only live in beds. We sort of touched on this one already--a lot. But, it is important to add a few more pieces of information. Bed bugs can live under carpets, inside walls, behind baseboards, in electrical outlets, behind crown molding, and more. If you find bed bugs in your home, it is vital to contact a professional pest control company to assess your infestation. They can literally be anywhere in your home. If you need assistance with bed bug control, and you are in our New England service area, contact us today. 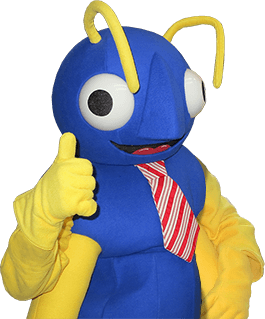 Big Blue Bug Solutions offers the most advanced solutions for bed bug prevention and control.